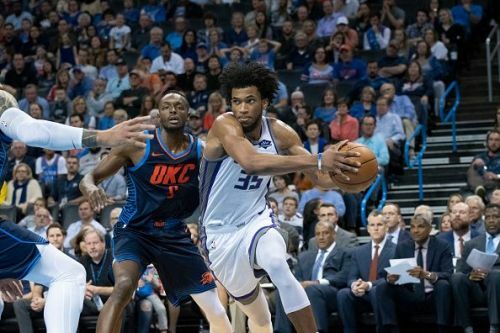 The Sacramento Kings boast of a 6-3 record right now, and while sophomore De'Aaron Fox has been the key to their success, their second unit has been offensively propped up by Bagley. While Bagley was more of a typical post-up player at Duke, he’s an All-World athlete at 6'11" who will be one of the league's most terrifying rim-runners in the years to come. Despite playing only 23.3 minutes per game, Bagley is currently 4th in scoring (12.4 ppg) & 2nd in rebounding (7.1 rpg) among rookies. He's shooting 53.4 percent overall and 5-for-9 from 3-point land - translating his sparingly used shooting range from college to the pros already. His best performance came Oct. 23 in a loss to the Nuggets. He finished with 20 points, 9 rebounds and 5 blocks in 32 minutes. Bagley is primed for a starting role if/when Willey-Cauley Stein slows down, and will have the stats to match the top 3 players on this chart then onwards.